Before placing your order for a stair rope, rope bannister or handrail, please review the information and installation guidelines in the website. Check through our price list below to calculate the price of your stair rope. An example stair rope costing is shown here. Once you are happy with your choice and measurements, please contact us by email with your requirements. You should receive an immediate acknowledgement email with details of current lead times. Type of rope and length. 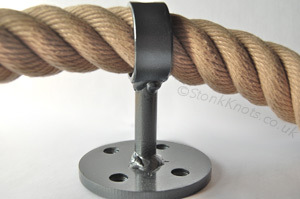 Note that the rope length should be measured between end bracket centres (excludes the space taken up by the knot). We charge for this by rounding up to the half metre, eg. 3.3m is charged at 3.5). Type of bracket and number. It would be helpful to know at this stage whether the brackets are to be fixed in position on the rope or left "floating", their positions to be determined during installation - for more information see these guidelines. The choice is between 2 and 3 ply manrope knots, eye splices, crown and manrope knot end or a selection of decorative tassel ends. More information on our knots page. A billing address and delivery details if different, including a telephone number for the courier paperwork. We will email you with a quotation or pro forma invoice (in .pdf) and a delivery estimate. We require payment with order in Pounds Sterling only: bank transfer drawn from a UK bank, or credit/debit card. We will email to confirm receipt of payment, and again when the stair rope is despatched. See below for details of payment options. We will provide an estimate with the stair rope quotation - the delivery schedule will depend on the materials ordered and level of work in progress. See stair ropes faqs for more information. This is our preferred method of payment within the U. K. for which we give a a 2 % discount. Payment may be made online, via telephone banking or with cash into our account. We accept payment in sterling only. Most banks can now process faster payments - these are usually transferred instantly or within a few hours. If you wish to pay by this method we will provide our bank details on the quotation. Wrought iron custom design P.O.A. ∗ Satin black finish, round base plate, round stem; choice of 3 stem heights (see Fittings page). 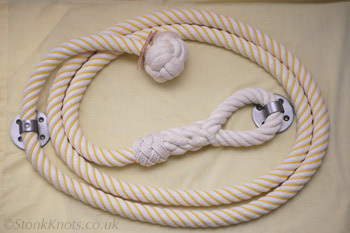 Cotton stair rope wound with yellow polypropylene cord - whipped eyesplice and manrope knot.